One trading rule that has held sway for much of 2009 is that a weak dollar is good for corporate profits and commodities like gold and oil. And for much of this year, with the record levels of U.S. borrowing, traders bet that the dollar would keep getting weaker. But with November's better-than-expected employment report, traders are now thinking about reversing those positions. 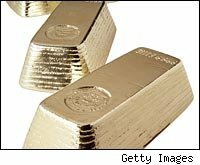 Gold has tumbled in the last few trading sessions, falling $26, or 2.22%, to $1,143.50 an ounce early Monday according to CNNMoney. (As of 4 p.m. Monday, it had bounced back a bit, to $1,155.10.) Meanwhile, the dollar hit a five-week high against a basket of currencies Monday and also rose against the euro. Since gold is often thought of as a hedge against an inflation-led economic meltdown, it may be time for gold bugs to lighten up, as I have hinted. Why is the dollar strengthening? It could have something to do with traders changing their minds and deciding that after the U.S. lost just 11,000 jobs -- 114,000 fewer jobs than expected -- in November, the economy is at a turning point. And even though they expect that it could be up to 18 months before the Fed starts raising rates again, they are starting to place bets in anticipation of that right now. They believe that a stronger U.S. economy will lead to lower deficits, less debt and a higher dollar. Stock prices reflect investors' expectations of corporate profits, and a weak dollar can be good for profits when big U.S. corporations are making more of their sales outside the country. According to one expert I interviewed, that is what's happening. Vivek Wadhwa, who researches such topics at Harvard, told me that many big companies -- such as Caterpillar (CAT), International Business Machines (IBM), and Pfizer (PFE) -- are making most of their sales overseas (67%, 66%, and 57% respectively). If they sell their products in dollars to buyers in countries with stronger currencies, these companies are able to gain market share by selling at a lower price. Thus, a weaker dollar boosts their profits. But it is impossible to think about the future of the dollar without considering China. That's because China lent the U.S. $1.2 trillion worth of its $12 trillion national debt. And despite our record level of borrowing, we can borrow at nearly negative interest rates. To understand why, I spoke with Harvard economics professor Richard Freeman, who argues that China and the U.S. are locked in a kind of mutually assured destruction scenario. Freeman prefers to look at it from a positive point of view -- e.g., we both benefit together. As I have written before, the U.S. needs China to finance our growing deficits, while China needs us to buy its cheaply manufactured consumer goods; and it needs our securities as a relatively safe place for its people to save their money, which they must do to make up for China's relatively sparse pensions and other social safety nets for its workers. Meanwhile, China keeps its currency artificially low relative to the dollar because if the dollar gets weaker, the returns China gets on its U.S. debt holdings decline even further. And since China has loaned the U.S. so much, it cannot afford to let us default, according to Freeman. That's why the dollar could rise rather rapidly if traders decide that the U.S. economy is getting stronger. The combined effect of both China and traders wanting a stronger dollar could push up our currency quickly. This would probably hurt stocks since the stronger dollar would crimp corporate profits. And as a strong dollar means weaker gold, now would be a good time to take profits in gold. Meet Peter Cohan at The World Money Show Orlando, Feb. 3-6, 2010, at The Gaylord Palms Resort.